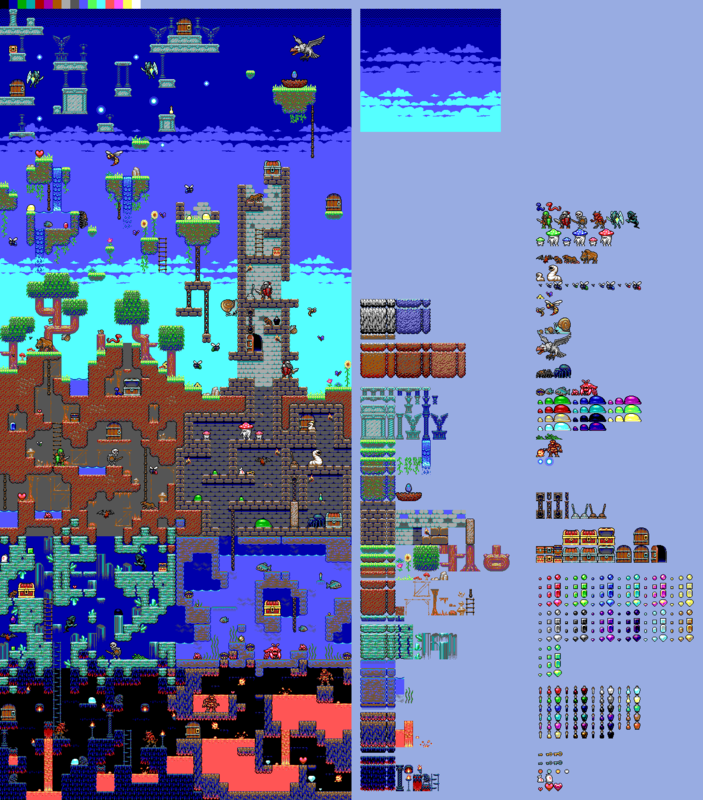 Tiles and static sprites for a adventure platformer in the vein of the Monster World series. Using the default EGA palette. Great work! I followed the creation thread on Pixelation, which was quite a bit of fun as well. Thank you very much for posting all these delicious assets here. Intant favorite ... Ahh a trow back to the good ol' days : Dangerous Dave , Ghosts and Goblins what more do you want ? An amazing set! I added some tags to the submission. surt Great work. Are these for a particular game in progress, or for something that does not exist as-of-yet? qubodup: It certainly could have done with a few extra tags, but limiting them to things that are actualy in the image would be a good idea. I trimmed off most of the nonsensical ones. ceninan: No game, just for kicks. bart: There is an "ega" tag buried somewhere in there. This is great, I love your submissions and I would love to do a game with this graphics. You deserve money for it! Could you include some more licensing information? CC-BY-30 and GPL are very different. "WORK_NAME (WORK_URL) Copyright WORK_CREATION_YEAR AUTHOR_NAME (AUTHORURL) licensed under FULL_LICENSE_NAME (LICENSEURL)." You will have to read and understand the license texts (look for "legal code" link on CC licenses) to know the implications of the license. Yeah I know how to attribute CC, but it is CC and GPL. Can I chose one myself? I think dual licensing without statement is quite problematic :). CC-BY-30 allows for commercial use, GPL does allow it too, but only if your adapted work is GPL either. So this is quite a problem :). If a work is licensed under GPL and CC-BY-SA, you can pick either of these to use it. Could I use this in a game I'm thinking of making? Please quit flooding with nonsensical requests. If I wanted it under CC-BY it would already be that way. So you basically saying "yes i am fully conforming that i obstruct usage of this asset in anything but GPL projects and have no intention on further sharing beyond that". Keep in mind that -SA creates whole load of problems associated with it if someone would want to add tiles to commercial project or any other project with custom license (such as BSD to example). Man, I would love to use these in a game. Would it be asking too much for you to made animated versions of some of these characters?